In 2018, we are all determined to become more mindful of our environment. A lot of the food being produced is going to waste and it is an environmental disaster. Food production is a resource-intensive process which needs energy, water, soil, and human labour along with a web of production, distribution infrastructure and processing. When we throw away food, we waste all of these resources. Fortunately, this food waste dilemma is a solvable one. While the problem must be addressed in each individual sector, from farming and retail, to restaurants and consumers, there are ways we can each help to reduce waste. Read part I of our two-part blog post and find out some easy ways we can all reduce our personal food waste and take one step towards the betterment of our environment. We all have the habit of buying more food than we actually need. When we do this, we end up throwing some of the food away because it may have stayed in our fridge or pantry for a long time. We may also forget about certain food items that we purchased or can’t find what we need when we need it because there are too many things. The solution to this is a simple one. Buy only what you need and eat whatever you buy. A way to avoid waste is by shopping smarter. Think about the meal or meals you need to make before setting out to buy groceries. Know which ingredients you will need and the ones you already have. If you are a tech-savvy cook who likes being updated with the current trends, you can also make use of meal planning apps and websites. Never purchase more food than you can consume. When shopping for groceries, most people tend to shop like it is for the apocalypse, which is one of the worst things to do. You can either use apps available on smartphones to make a list of the things you need. Or you can also go old-school and simply use a pen and paper to do so. Keeping the shopping list near you allows you to add items to it when you run out. It won’t be a bargain if you don’t even eat the food you get. Never be enticed by promotional sales to purchase more food. This will require putting in some conscious effort on your part. You will have to keep a track of all the food you have and also eat it all. Here’s how. Chances are that we have all found mouldy food lurking in the back of our refrigerator and not knowing what it is. Remember to keep your pantry and fridge clean so you are aware of the things you have. You can also move the older foods towards the front so they are used first. Use the ingredients that spoil quickly first. This means that the raw meat, leafy greens and fish should be consumed early. You can find recipes online for food which incorporates the ingredients you want to use. Remember to keep your kitchen stocked up with staple ingredients you use on a regular basis. This allows you to have fresh ingredients on your hands all the time. 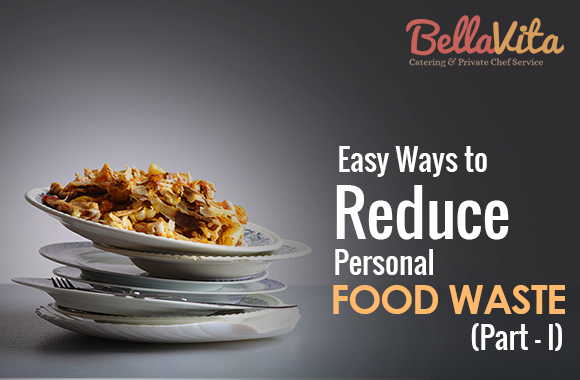 These are some of the ways in which you can reduce personal food waste. To find out more, read Part II on our blog.